Nobbs must have welcomed this change of material, for he early appreciated the beauty and durability of the local limestone. He admired the way the builders of Montreal's plain late Georgian structures had handled the stone: "Their delicate little mouldings, broad plain surfaces, and slightly projecting pilasters and bands exhibit the delightful grey tone of this material to perfection. "9 By the time he designed the Union, Nobbs was already learning much from studying the old architecture of the province - both urban and rural. In the spring of his first year at McGill he had sent his students out to measure and sketch some of the ancient landmarks of Montreal. The following spring he would be exhorting the young architects of the Sketching Club to study the local work of the seventeenth and eighteenth centuries as a wholesome antidote to current eclecticism, assuring them that if William Morris had been familiar with the charm and quaintness of the old Quebec farms and seigneuries, he would have written as appreciatively of them as he did of the vernacular art of England.10 Nobbs, like Morris, Webb, and Lorimer, delighted in the simplicity and individuality of old, unpretentious building; and he admired the way in which the early French and English inhabitants had functionally adapted the traditions of their respective homelands to the Canadian environment. In his design for the Union he followed a similar approach. Since the Union was essentially a student club at an English-language university, Nobbs obviously felt it appropriate to draw on England's contribution to Canada's architectural heritage. The form of his building was thus based on the palazzo tradition popularized by Charles Barry in his famous London clubs dating from the early Victorian period. The palazzo club remained an important building type in the early twentieth century. Two other examples were currently rising on Sherbrooke Street: Strathcona Hall (1904-5) by the Montreal architects Finley and Spence and the Mount Royal Club (1904-6) by the New York firm of McKim, Mead and White. Like the province's early builders, Nobbs rejected elaborate detailing, even in the first proposal, simplifying his forms further in the final greystone version. For example, the three types of window treatment found on the upper floor in the first proposal were reduced to one: tall, rectangular lights crowned by slender, semicircular, pedimental mouldings. A chimney breast on the west elevation was made less elaborate, while the parapet, which had originally featured a raised central section, was changed to a single height, rhythmically punctuated by shallow forward projections. Nobbs recognized that a simple treatment suited Montreal greystone, an obdurate material to work, but one that withstood the rigorous climate. Despite the differences engendered by the change of materials, the influence of Shaw persists in the Union. Shaw's contemporaries were dazzled by his ability to mix stylistic motifs in a highly expressive and individual manner; and Nobbs carries on in this vein, drawing freely from a variety of English architectural periods, mainly, though not exclusively, classical.11 A powerful, neo-Baroque surround gives emphasis to the main doorway, neo-Gothic oriel windows distinguish the first floor, while the slender, classical-style mouldings are reserved exclusively for the second floor. There were other reasons for Nobbs's purposeful emphasis on the Union's English lineage. During the period in which this prominent structure was built, there was strong American influence on Montreal's architecture. Shortly before the turn of the century, Bruce Price had carried out several major works in the city, notably, Windsor Station (1887-89) and Royal Victoria College (1895-99). In 1901 McKim, Mead and White received the most prestigious commission of that decade, the extension and renovations to the head office of the powerful Bank of Montreal on Place d'Armes. Nobbs admired McKim's high standard of work, but he was sorry to see so many important jobs go to outsiders.12 Although himself a newcomer, Nobbs was committed, both as a teacher and an architect, to creating Canadian architectural excellence. Where he chiefly differed from the American firm's current work was in the intentional individuality of his designs, which he conveyed in large part through carefully chosen ornament. McKim, Mead and White, too, made use of Montreal limestone, severely handled, but the impersonality and machine-like precision of their Beaux-Arts manner reflected a modern trend that Nobbs found profoundly disturbing. "Standardization," he later wrote, "is the vice of the Americans. "13 For him, the true meaning of style was "that stamp of individuality that makes a building partake at once of the soul of the man who conceived it and the people who reared it. "14 "There is room," he observed in 1906, "in a scheme of formal dignity for national tradition. "15 In the Union, then, the details pay tribute to some of Nobbs's architectural forerunners: Inigo Jones, James Gibbs, Barry, Shaw, all of whose work had influenced Canada.16 Combined with these are local references including the coat of arms of Sir William Macdonald and the McGill shield, which Nobbs, a lover of heraldry, had designed. All these diverse, but carefully selected, ingredients are combined in a unique and personal creation that has a breadth and presence far surpassing both Strathcona Hall and the Mount Royal Club. The ultimate effect of the Union - an austere elegance - depends on its beautiful proportions, an exquisite balance of solids and voids, and the subtle contrast between superbly laid ashlar masonry and discreet ornament. Chaste and static in the manner of English Palladian architecture, the expression is at the same time modern. The narrow mouldings, the flattened planes of the oriels that hug the smooth wall surfaces, and the unclassical elongation of the upper storey windows are typical of the period. Shaw, Mackintosh, and Ashbee, among others, worked in a similar manner.17 While Nobbs's strong cornice line and powerful main doorway provide a necessary vigour to his composition, the flatness and thinness of the major components are suggestive of the building's internal supporting steel frame.18 The window mouldings, for example, appear to be applied to the surface, indicating they are not structural elements. Honesty of structural expression was an important Arts and Crafts principle with roots deep in the Gothic Revival. The architect's Arts and Crafts background was also clearly evident in the original interior of the Union (Figs. 5, 6). Nobbs was largely responsible for the fittings and furnishings, designing furniture, plaster decoration, wrought iron, and even the letterhead for the Union stationery. Although the furniture was made in England, a contemporary account notes that the building was furnished as far as possible in Canadian woods. For the interior, too, Nobbs drew on a variety of historical periods, giving Canadian motifs an important place in the decorative scheme. The hall, for example, which featured arcades and a beamed ceiling, was finished in Burmantoft's terra cotta with the heraldic de- vices of the Canadian provinces as the main ornamental feature. The large student lounge on the floor above, which extended across the entire front of the building and was lit by leaded casement windows and the oriels, had an Elizabethan theme. Here the figures of the McGill shield were used as the basis for the decoration. Throughout, the outstanding qualities were beauty and comfort without ostentation - the hallmarks of good Arts and Crafts design. Public response to the new building at the time of the official openings in the winter of 1906-7 was highly favourable. As one reporter quaintly put it: "All the guests moved from one portion of the big building to another, exclaims of surprise and admiration were ever heard. "19 The new Macdonald Professor had indeed fulfilled his commitment to set a high standard for Canadian architecture. 1. MUBGMB, 1897-1910 (15 June 1904), p. 290. 2. The agreement between the architects is in the Peterson Papers. 3. MUS 2, p. 168 (Montreal Daily Witness, 11 Aug. 1906). 4. The large watercolour presentation proposal, preserved in the CAC, is signed "P. E. Nobbs des & delt," and dated "1st Sep. 1904." 5. Nobbs [Concordia Salus], "Montreal Notes," CAB 18 (Oct. 1905), p. 157. 6. Nobbs [Gargoyle II], "Montreal Letter," CAB 17 (Aug. 1904), p. 126. 7. MUS 3, p. 59 (Montreal Herald, 11 June 1917). 8. Nobbs, "Sir William Macdonald," McGill News 4 June 1923), p. 2. 9. Nobbs [Concordia Salus], "Montreal Notes," CAB 18 (July 1905), p. 109. 10. Nobbs, "On the Value of the Study of Old Work," CAB 18 (May 1905), p. 74. 11. Nobbs wrote in his book, Design: A Treatise on the Discovery of Form (Toronto: Oxford University Press, 1937), pp. 397-98, that consistency with tradition was the last thing to look for in Shaw's work. 12. Nobbs [The Gargoyle], "Montreal Letter," CAB 17 June 1904), p. 90. 13. 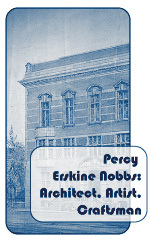 Nobbs, "Architecture in Canada," JRAIC 1 (July-Sept. 1924), p. 92. 14. Nobbs, "The Styles of Architecture and Style in Architecture," CAB 16 (Nov. 1903), p. 184. 15. Nobbs, "The Official Architecture of European Capitals," p. 40. 16. Jones (1573-1652) was influential only indirectly as the founder of English classicism. Gibbs (1682-1754) exerted widespread influence in North America through his Book of Architecture (1728). The neo-Baroque entrance surround used by Nobbs in the Union is known as a Gibbs surround, a treatment Shaw also enjoyed using. 17. The Scottish architect Charles Rennie Mackintosh (1868-1928), one of the most advanced designers at the turn of the century, carried out the majority of his works in the Glasgow region. Charles Robert Ashbee (1863-1942), although trained as an architect, is known chiefly as the founder of the Guild and School of Handicraft in the East End of London (ultimately moved to Chipping Camden, Gloucestershire). 18. The exterior walls are load-bearing. 19. MUS 2, p. 201 (Montreal Herald, 8 Feb. 1907).